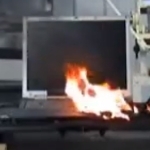 PC Safety, tips battery fire hazard, laptop battery fire, li ion battery. permalink. My serial numbers are not the same as shown but how do I know that a fire won’t happen to the one that I do have? (42T4752) How should I store it? I certainly don’t want my house to burn down because of a laptop battery!!! !